She knows a secret; he knows the future. Together they will expose the truth. Check out the reviews or download a sample. As a high school English teacher, I have my students write essays on controversial topics to teach persuasive argument. It has come to my attention throughout discussions regarding various issues on which they are writing, that many of the next generation of voters are startlingly selfish, uncaring, and downright hostile to the idea of helping others. Of course, it is not true of all of them, but many of them express this hostility openly, and it scares me. Is this a result of the current political climate, in light of such hot-button topics as the Affordable Health Care Act, the increasing deficit, or the bleak outlook of the economic situation in America? Are they simply regurgitating frustrations voiced by discouraged and over-stressed parents? 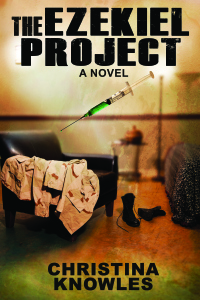 “The Ezekiel Project by debut author, Christina Knowles–Wow, this was a ride and a half! A fast-paced, interesting, thought provoking, edge-of-your-seat story about clandestine military medical experimentation, telekinesis, mind control, abuse, and love. Knowles is a master of pacing… Impossible to put down … highly recommend … This just-released suspense novel is a sleep-robbing page-turner!” –Lee Fullbright, award winning author of The Angry Woman Suite. A young mother risks everything to expose a top-secret government project with the help of its most important test subject, a dying Gulf War veteran with paranormal abilities . . .
Eleven years after the bombing of his battalion in Iraq, Joel’s nightmares continue. But when a beautiful young mother enters those dreams, he knows he must do everything in his power to save her from those who want to silence her, including stopping the man responsible for his nightmares, her husband and the man who has been keeping him prisoner in a top-secret government facility in charge of The Ezekiel Project.